I picked up the movie theater size box of mini Charleston Chews today and I ate the WHOLE box! 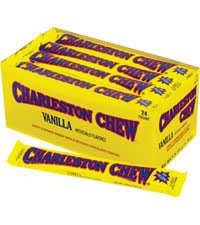 I had my first Charleston Chew on my first trip to Charleston. The hotel me and my hubby stayed at had these in the lobby for guest and I had to have one every time we entered or left the building. So they have good memories and make me happy. They also make my thighs beg for forgiveness!